In the winter of 1853-1854, Swiss archaeologist Ferdinand Keller examined a ghostly cluster of wood posts protruding through the top of the Lake of Zurich. A drought had lowered the water level, exposing the bizarre beams. Were these posts the supports for lake houses centuries ago? Keller’s assessment fascinated the public, stating the homes belonged to a long lost society, or lake dwellers, of early Europeans. 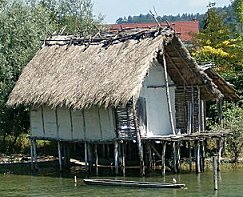 The idea of prehistoric people living above the water on stilts was just as captivating to scholars as tree people. Once investigations began on western lakes in the region, eyebrows began to raise. Scholars didn’t believe these so called “huts” were situated where Ferdinand Keller had believed. In fact, the opinion was that no houses were built on the lake on stilts, even though piles of wood were found under the water. There was a clear explanation for this, as water levels had risen since prehistoric times and submerged the homes. An archaeological dig took place from 1974-1975 on a small island in Lake Carera in Faive, Italy. Archaeology digs unearthed several Bronze Age dwellings dating to 2000 BC. They were constructed all over the water and on the sloping shores of Lake Carera. On dry land, the dwellings sat upon piles, the same as they do today to protect against rising waters. Modern scientific analysis and dating have shown that the settlements were slightly different from what had been supposed earlier. Specialists now prefer to talk about ‘lake people’, who actually built on land (in marshy areas). The Bantu speaking Baganda people created the state of Uganda from a small territory during the late 19th century, under their kabakas, or Buganda kings. The territory had little or no contact with the outside world until the middle of the 19th century, when Arab slavers penetrated the interior. The Spear Masters of the Dinka Tribe of the upper Nile are a hereditary priesthood, and according to mythology, their presence is reinforced by political and religious ideals. There are several legends of the origins of these spear using masters, one in which includes a lion and a man dancing. The Cro Magnon people left no written records about themselves, however they replaced the Neanderthals over 30,000 years ago. So what do we know about this prehistoric forerunner to the Homo sapiens? Similar to the Neanderthals, they buried tools, weapons, and ornaments with their dead.